Tamino (Mhlekazi Andy Mosiea) in Isango Ensemble’s The Magic Flute, a Chicago Shakespeare Theater World’s Stage presentation from South Africa, performed in the Skyline Stage, September 25–28, 2014. 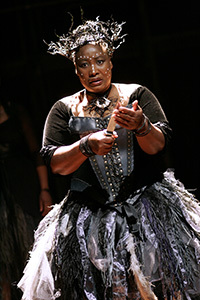 The Queen of the Night (Pauline Malefane) in Isango Ensemble’s The Magic Flute, a Chicago Shakespeare Theater World’s Stage presentation from South Africa, performed in the Skyline Stage, September 25–28, 2014. Sarastro (Simphiwe Mayeki) and the ensemble of Isango Ensemble’s The Magic Flute, a Chicago Shakespeare Theater World’s Stage presentation from South Africa, performed in the Skyline Stage, September 25–28, 2014.